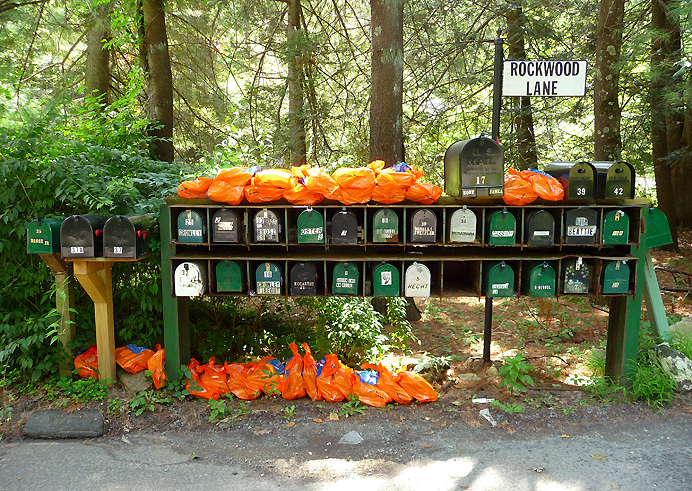 Rockwood Lane, a half-mile spur off Middle River Road, is one of the few dirt streets remaining in Danbury. Because it is technically a private road, the Postal Service won't drive it, but delivers mail to these boxes at the entrance. Today, I found an estimated 120 pounds of AT&T phonebooks in orange plastic bags plunked there by a private delivery service. Ironically, most of these books will never be used. Danburyites are still angry because the phone company merged our White Pages into those for all of Fairfield County (pop. 900,000) a few years ago, apparently to make more money selling ads in the Yellow Pages. Because the new books are so cumbersome, most of us do our lookups online. (My phonebook weighs more than my laptop.) We use the books mainly to elevate children at Thanksgiving dinner. .